Phew! Well that was fun. Hope everyone who attended the event had a great time. Good news, the membership team got a great deal of ideas and content for the newsletter and other content. Bad news, we had too much fun at the event and we will not be publishing until October. Hosted by the Wilbur Curtis at the headquarters in Montebello, California. The event attracted more than 75 techs with all levels of experience. 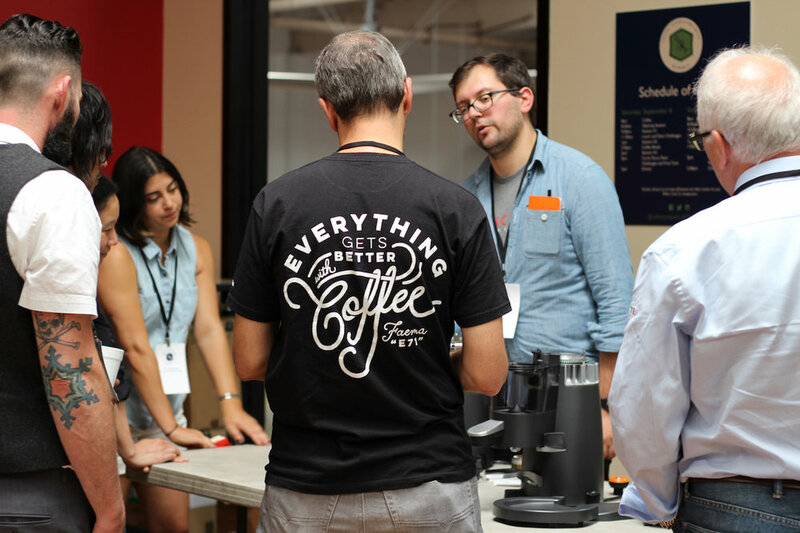 Attendees were subjected to a team repair challenge on a brewer where CTG Leadership Council members played the role of café manager and did everything that you’d expect them to when you’re trying to repair their machine. It was brutal. Amir Hashemi, from Wilbur Curtis took classes through the basics of using a multimeter and then challenged them to a practical exam by ‘breaking’ 4 brewers in clever ways and requiring clear documentation of each test performed to get to a solution. Also brutal, but realistic as missing something in testing can result in a failed repair or, worse, and injured barista or tech. Tonya Kuhl, of University of California, Davis, provided a great overview of the operation and design of coffee makers and espresso machines. Focusing on fundamental principles of chemical engineering, Kuhl provided a demonstration of a reverse engineered Mr. Coffee machine to illustrate the concepts she discussed. Rebecca McNelly, owner of Wichita-based Heartland Tech, led an interactive lecture on customer service and workflow. Attendees evaluated the key elements of customer service and worked together to apply these principles to different situations they would encounter in the field. Maria Cleaveland, regional sales director for the Western U.S. and Canada at Urnex, and Hylan Joseph, West Coast service manager for Minneapolis-based Espresso Partners, shared about the tools and cleaning supplies available on the market, and how to use them correctly. In addition to discussing some of the facts and falsehoods around cleaning and preventive maintenance, the session reviewed the most effective investments that equipment owners can make. Marty Roe, of Service Call LLC, led a lecture that took a look at a variety of water treatment methods and tools to help techs better advise their customers and achieve the best water quality. Roe also led a workshop focused on how technicians should approach service calls, engage with customers, and prioritize multiple projects, providing a framework for structuring the troubleshooting activities in a way that saves time and frustration for both the technician and the customer. With that I want to say thanks to everyone for attending the event and invite those of you who missed it to start saving now for next year. It’s worth it. We have Gearhead Events coming up in October and November and we will be sending out detailed reminders shortly. Look forward to some really great content in October!